An easy and quick meal that you can prepare at the beginning of each week…to have on hand for whenever hunger strikes. 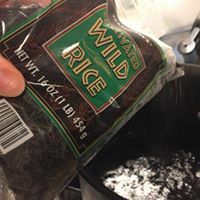 Bring 1/3 lb wild rice in enough water to cover 1” to boil. Cover with lid. Turn down heat to medium for a steady high simmer. Set timer for 50 min. Remove lid to check rice. If most of the grains have popped, strain off water and allow to cool. You can cook for 5-10 min more if you like a softer texture or more grains need to pop. While rice cools, break up 1 can of 14-16 oz. chunk chicken in a large bowl (the photo of 3 is if you want to triple the recipe). Add rice to combine. Containerize and refrigerate for up to one week. Enjoy by reheating for 45-55 seconds in the microwave and topping with a healthy fat condiment: avocado, giardiniera, parmesean cheese.